I'm still here. Just a few more weeks left in the quarter and I'll have more free time to BLOG and visit gardens and all that fun stuff. In the meantime, winter has returned to the Bay Area for a few days this May. Brrr. Rain, even. Here are some pictures from the garden yesterday. This Clematis was a freebie or a sale item. I wish I could remember from whence it came, but I'm pretty sure the name is 'Pistachio'. I've had it for a few years. I like the rather small flowers which are just starting to open. Under the deck Bartlettina sordida (Asteraceae) is having a banner year. 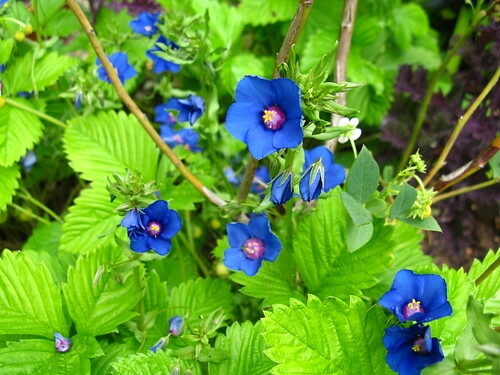 It's one of the first plants I planted when I started gardening in 2005. 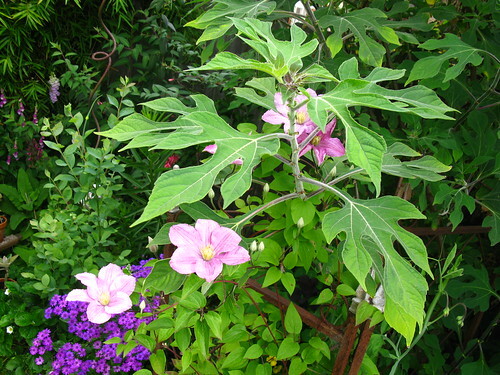 I started another Clematis in it last year, but the flowers have already faded. This is a close up of the disk flowers just opening up. They are fragrant, like vanilla. 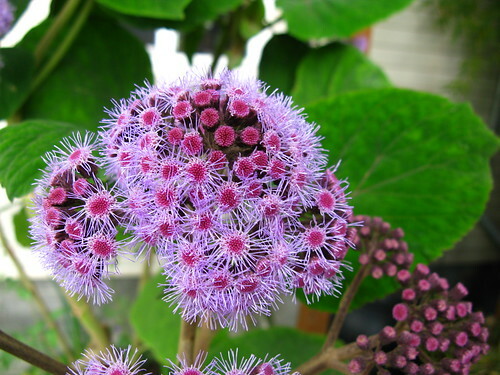 You'd think bees would love this plant, but I rarely see bees on it. That might be because it grows under the deck and bees tend to avoid shade, don't they? 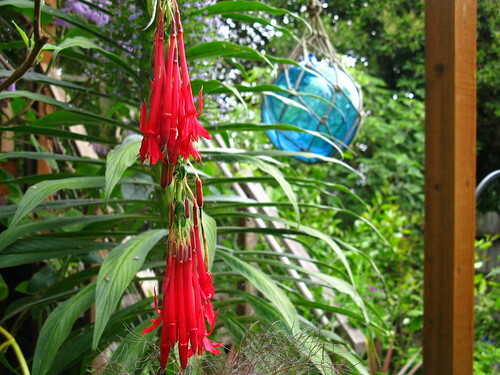 Fuchsia boliviana 'Rubra', dropping on to a bit of bronze fennel. Will I still be able to grow these fuchsias when we move to the 'burbs in a few years? Will I even want to? They're such San Francisco plants in my mind. If I were starting over, I might be inclined to make a whole fuchsia garden as the species is so well served by San Francisco's particular climate. This is 'Miep Aalhuizen'. I've had it's parentage explained to me but it's not something I've been able to memorize. With school, a lot of my botanical learning has gone out the window. 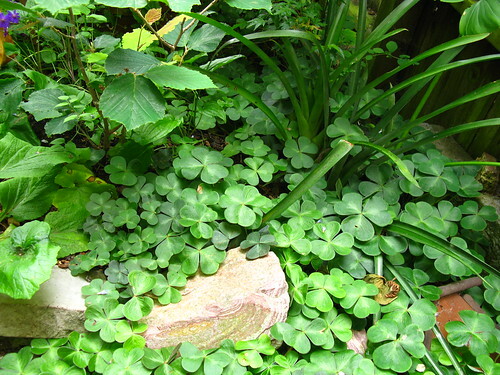 The understory here, if I may be so pretentious as to refer to my garden's groundcover as an 'understory', is native redwood sorrel (Oxalis oregana). 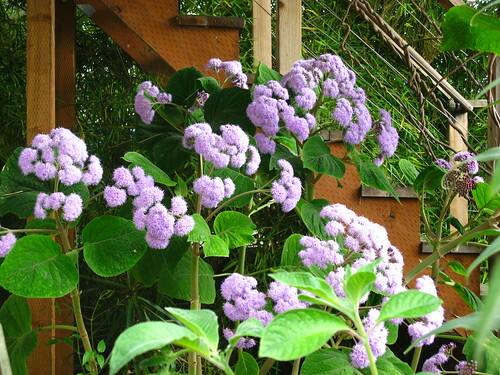 It's a phenomenal plant for shade. Great texture, huge spread. Nice flowers even. Love, love, love. It thrives without any summer water, owing I assume to San Francisco's foggy summers which very much resemble any redwood forest ecosystem from which the plant hails. 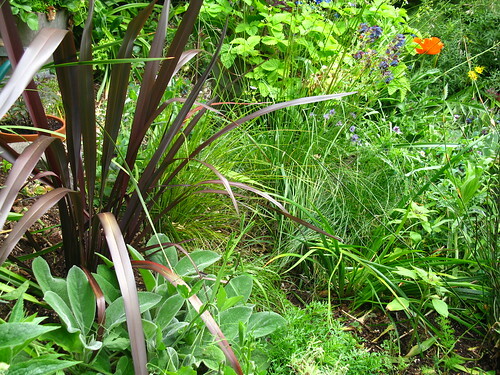 In the sunny parts of the garden, my preferred ground cover plants are native perennial bunch grasses, but I've also been experimenting with exotic carexes which come in different colors. I want to explore that some more this summer when I'm out of school. In a bigger space I would dedicate a large area for just monocots. 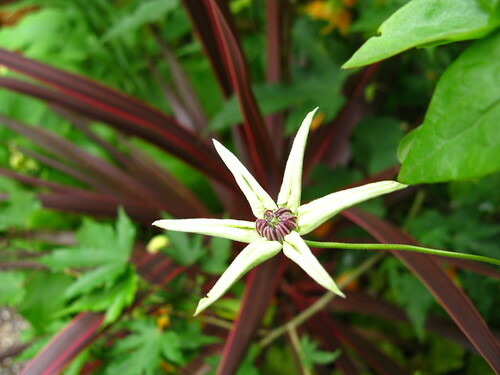 Are there any good blog posts on monocot gardens out there? Tell me in the comments. I'd like to check them out. 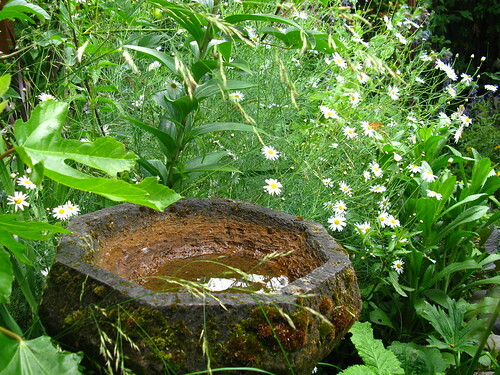 I'm sorry to say I have not been too diligent about refilling the bird bath this year. I feel lucky to visit the garden at all right now. Well, I filled it up today. 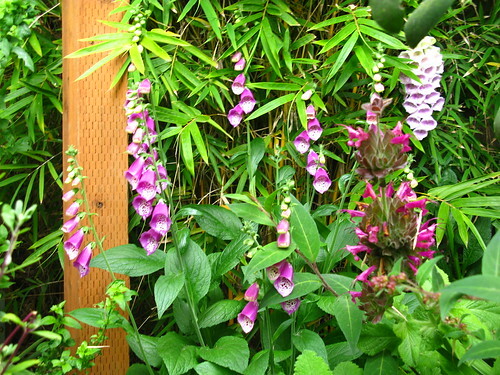 I haven't had foxglove in a couple years. The seed packet promised me a range of colors, but they all came up purple. Why do I still believe those things? Anagallis monelli with the very chartreuse leaves of Fragaria vesca. It's a fine blue, but I prefer the purer blue of native desert bluebell Phacelia campanularia (who's already come and gone this year). I'm thinking about starting some more tho'. 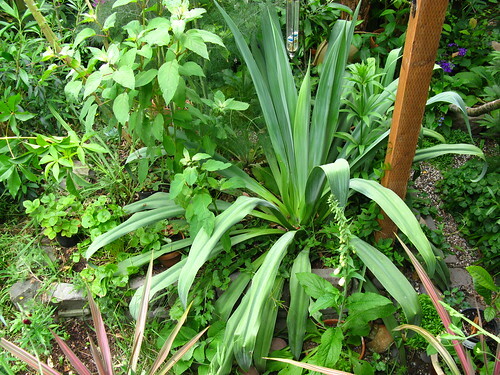 I'll end with the Beschorneria which is slowly attaining gigantic proportions. 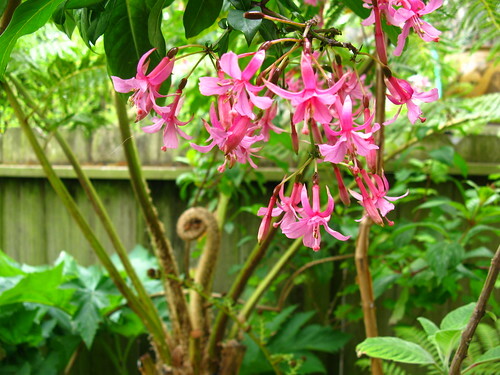 This is another plant from the cloud forest that goes with the fuchsia and tall Bartlettina. I have a feeling it will flower in the next year or two. I hope it does before when/if we move. Thanks for coming by. I'm sorry there's been so little new content here lately. It's just a temporary situation in the big scheme of things.